Welcome to the City of Norcross’ Tree Walk. Norcross’ historic downtown area with picturesque rows of restored narrow brick buildings illuminated by old-fashioned street lamps is complemented by our abundant tree canopy. We are very proud of our trees and the charm they add to our town, particularly the many large, old specimen trees. 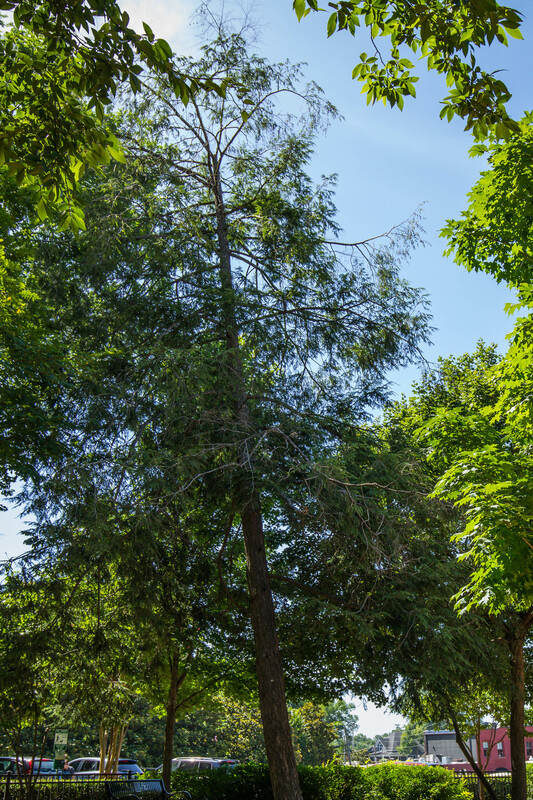 We hope you will enjoy walking through two of our lovely downtown parks admiring and learning about the variety of trees in our canopy that you will see along the way. Our tree walk begins at Tree No. 1, an American Elm that is standing proudly in Betty Mauldin Park next to our City Hall. 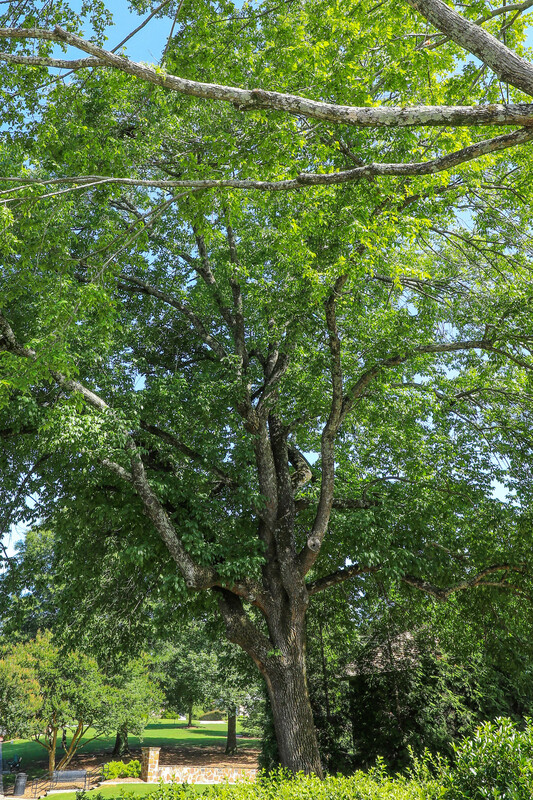 This tree has been judged by the Georgia Forestry Commission to be the number one champion American elm tree for the State of Georgia. As of August 16, 2016, this tree stands 80’ tall with a circumference of 233 inches (nearly 19 ½ feet around) and has a crown spread of 125 feet. Native to North America the American elm was an abundant tree in North American forests. When L’Enfant and George Washington laid out the city of Washington they envisioned it with tree lined streets and the American elm was the chosen tree because of its tall upright form. This was once a popular and common tree found along city streets all over the U.S. reaching heights over 100 feet. Tragically the American elm has been devastated in many parts of its natural range by Dutch elm disease, which was introduced into the U.S. on a shipment of logs from Europe in the 1930’s. This catastrophe prompted the discouragement of planting monocultures of any single species of trees in cityscapes. The wood of the elm has an interlocking grain that makes it resistant to splitting, and it was highly valued by the furniture industry and by wheelwrights for making wagon wheels. 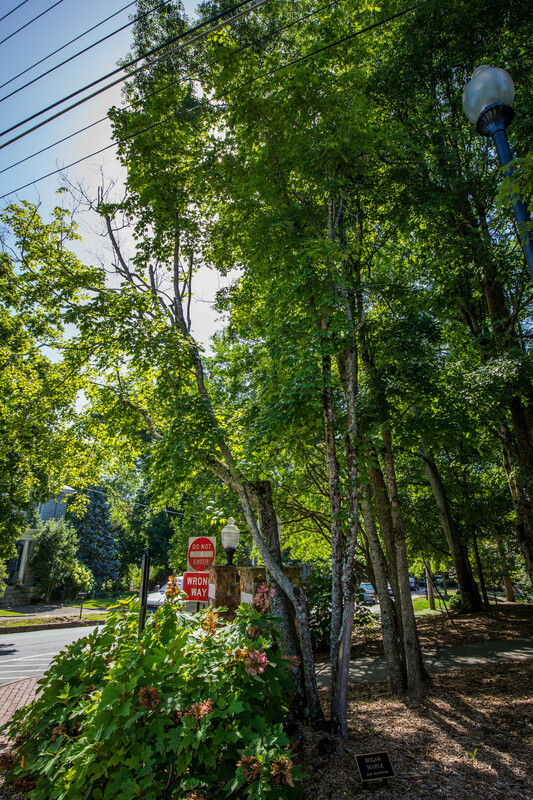 While the American elm is the State Tree of Massachusetts and North Dakota, this tree, which is at one of the city’s gateways, is one of Norcross’ proudest landmarks and has been welcoming visitors for over a century! This magnificent pecan tree is of the hickory species and is native to the Mississippi River Valley and to Georgia. Its nuts were a food source for Native Americans and were consumed and traded between the tribes. These nuts can provide two to five times more energy per unit weight than wild game, require no preparation and can lie on the ground for a year and still be edible. The Algonquin Indians called them “Paccan,” meaning hard nut that takes a rock to crack. Fur traders brought pecan trees to Illinois where they got a name change to Illinois nuts. Washington and Jefferson both planted pecans on their estates and called them Illinois nuts. The groves were considered so valuable that Washington dispatched a military force to protect the groves from the British during the American Revolution. Texans valued pecan trees so well they named it their State tree. The pecan tree continues to be a major nut producer for the U.S. which provides more than 80% of the world’s pecans with Georgia being the number one pecan producing state. The tree produces nuts every other year. It also provides great shade and sports an amazing wood grain that makes it highly prized as wood for furniture and flooring as well. They can live up to 200 years and grow to a height of 100 to 130 feet. The 1996 Summer Olympics paid homage to the pecan tree by making the torches, which were carried over 15,000 miles, out of pecan wood. There must have been groves of pecan trees in this area before the city was founded in 1870, because these stately old pecan trees can be found all over Historic Norcross and they continue to serve this community well! The Eastern Hemlock is a large coniferous evergreen tree native to North America and is very long lived. The oldest known specimen is 554 years old! The tallest surviving Hemlock is 170 feet tall. Although slow growing as a landscape tree, it is a favorite for privacy screens and hedges because of its handsome, graceful appearance and its ability to survive shearing to any shape or height. The tree is cone bearing and found primarily on rocky ridges, ravines and hillsides with relatively high levels of moisture. The wood is soft, coarse-grained, and a light buff in color. The lumber is used for general utilitarian construction and crates. Because of its unusual power of holding spikes, it is also used for railroad ties. The species is currently threatened by the hemlock wooly adelgid, a sap-sucking bug accidentally introduced from East Asia to the U.S. in 1924. Virtually all the hemlocks in the Appalachian Mountains from northeastern Georgia to southeastern Maine and as far west as eastern Kentucky and Tennessee have seen infestations of the insect within the last five to seven years. The tree is also susceptible to acid rain that is the result of air pollution. 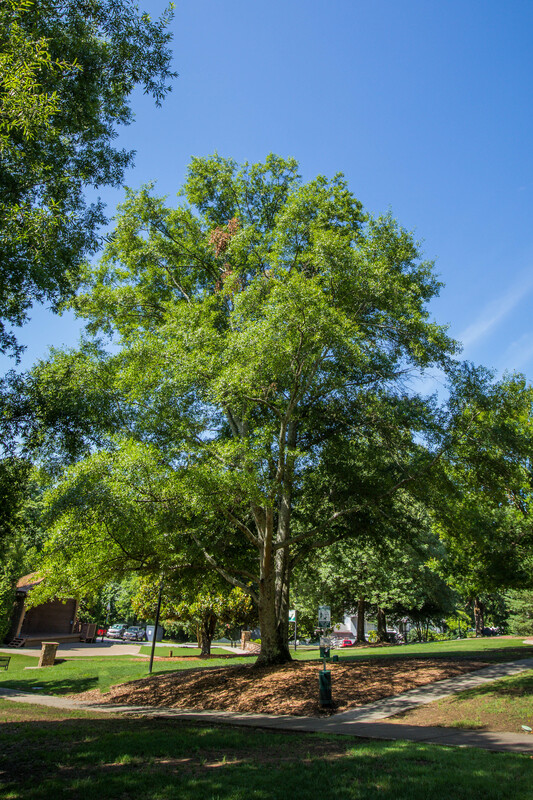 We hope this species of tree will make an impressive come-back in Georgia and meanwhile we are honored to showcase this treasured specimen in Thrasher Park. The black locust is native to the eastern U.S. but the exact native range is not accurately known as the tree has been cultivated and is currently found across the continent. The name ‘locust’ is said to have been given to the tree by Jesuit missionaries, who fancied that this was the tree that supported John the Baptist in the wilderness. However, the black locust is native only to North America. It grows to 80’ tall and 2’ to 4’ in diameter. As the strongest timber in North America, the black locust helped build Jamestown and American navy ships that decided the War of 1812. It was nicknamed “the tree upon which America was built.” It is very resistant to rot, and durable, making it prized for furniture, flooring, paneling, fence posts, and watercraft. As a young man, Abraham Lincoln spent his time splitting rails and fence posts from black locust logs. Black locust is highly valued as firewood for wood-burning stoves because it burns slowly with little visible flame or smoke, and has a high heat content. The wood, bark and leaves of the black locust are toxic, although rabbits have been known to feed on the bark in winter. Some songbirds eat the seeds, which are toxic to people. It is a major honey plant source for honey bees in the eastern U.S. and was therefore transplanted to Europe. In many European countries, it is the source of the renowned “Acacia” honey. 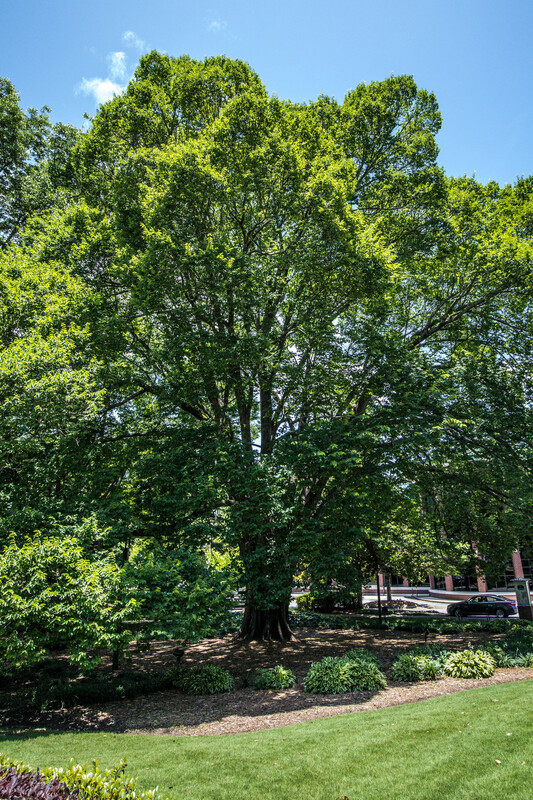 The first streetscape plantings of this tree were in Williamsburg, Virginia in the 1730s. This tree species is shade-tolerant and commonly found in forests in the final stage of natural succession. The wide spreading canopy provides great shade in the summer and beautiful bronze coloring in the fall. The wood is heavy, hard, tough and strong, and until the advent of power tools in the 20th century, groves of beech trees were often left uncut for commercial lumber. As a result, many areas today still have extensive groves of old beech trees. Beech trees can take up to 40 years to begin producing seeds and nuts. Large crops are produced by 60 years, and the tree’s total lifespan may be up to 300 years. Beech nuts, the crops which occur every 2 to 3 years, are edible to humans but too small to be commercially valuable. However, beech nuts were one of the primary foods of the now extinct passenger pigeon. The loss of oak and beech forests is pointed to as one of the major factors that contributed to the bird’s extinction. The red maple is the best named of all trees because it is resplendent in red during all four seasons, showcasing red buds in the winter, red flowers in the spring, red leafstalks in the summer, and brilliant red foliage in the fall. This pageant of color, along with its tolerance for a wide range of soils and relatively fast growth, make it the most widely planted landscape shade tree. The red maple is the most common and widespread of deciduous trees in eastern and central North American forests. The U.S. Forest Service recognizes it as the most commonplace and adaptable tree in North America. Dozens of varieties of the tree have been propagated for its wide range of attractive fall colors. It is commercially used on a small scale for maple syrup and lumber. Although it is the state tree of Rhode Island, we love and enjoy our red maples here in Georgia! The sugar maple is also prized for its beautiful fall colors that range from yellow to brilliant reddish-orange. It is one of America’s best-loved trees. In fact, more states have claimed it as their state tree than any other single species (New York, West Virginia, Wisconsin, and Vermont). While it is the primary source of maple syrup, its wood too has many desirable uses. Sugar maple trees with wavy woodgrain are especially valued for furniture and gun stocks. Maple is also the wood used for basketball courts, including the floors used by the NBA, and it is a popular wood for baseball bats, pool cues, bowling alleys and bowling pins. Wood from the sugar maple is widely used in the manufacture of musical instruments, such as violins, guitars and drum shells. Additionally, because the wood is quite flexible it is also prized for archery bows. Canada considers the sugar maple as one of its most important trees, so much so that the sugar maple leaf is featured on the Canadian flag. 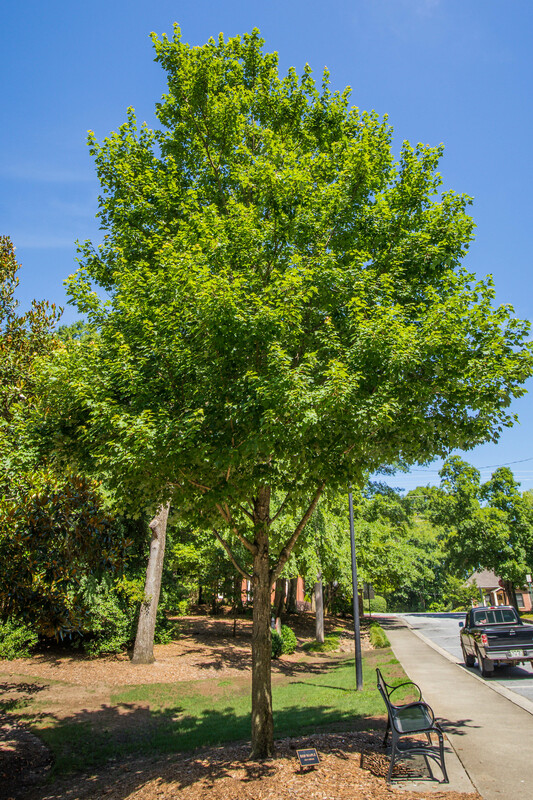 Although sugar maples thrive best in northern cooler climates, they are still a favorite landscape tree in Georgia. The American holly is a native evergreen tree of southeastern North America and is commonly found from Virginia to Florida. The male and female are different trees, with the female bearing the characteristic red berries. Holly sprigs are widely known as the everlasting symbol of Christmas cheer. In English stories and poetry the holly is inextricably linked with the Christmas season. The holly is typically a medium size understory tree with leaves remaining on the branches for two or three years before falling in the spring, when pushed off by growing buds. Leaves can also be used to make a tea-like beverage that does not contain caffeine. The berries are reputedly poisonous to humans but they are a vital food source for birds during the sparse winter months. The wood of the holly is very pale, tough, and close-grained, but it takes polish well and is prized for whip-handles, engraving blocks, and cabinet work. It can also be dyed and used as a substitute for ebony. 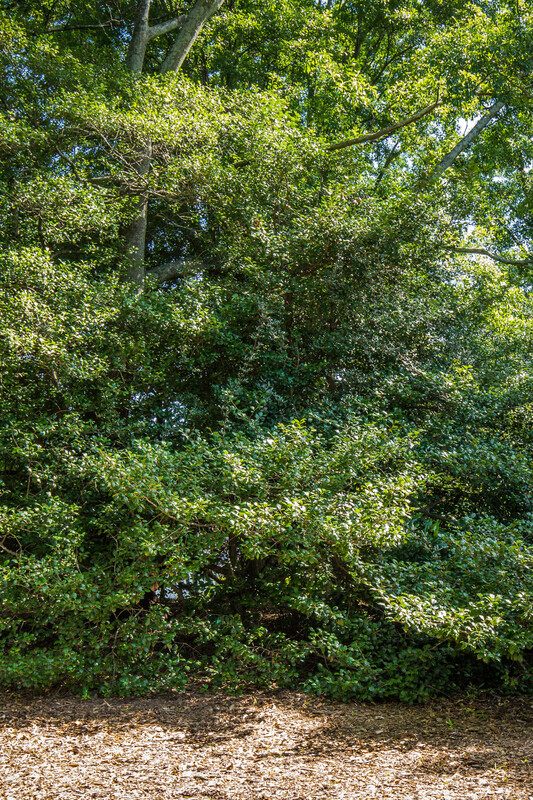 The American holly is such an appealing tree that it is used extensively as an ornamental landscape plant. It is also the state tree of Delaware. As a tree many find most representative of the South, the Southern Magnolia is an ancient species native to North America and China. It was also a native of Europe until the last ice age wiped them out. Fossils of the magnolia have been found as far back as 38 million years ago. It is a primitive tree that is pollinated by beetles instead of bees because it evolved before bees. The Southern magnolia name can be misleading because, although it is prevalent in the South and is the state tree of Mississippi, its zone 6 planting range means it can grow as far north as Maine, Michigan, and Washington State. The magnolia was named for Pierre Magnol, the French botanist that discovered them in Florida. This hardy tree is quite tough and pest resistant and was a favorite of southern plantations where the lower branches were staked to make them root in the ground to give them more stability. Their beautiful late spring intoxicatingly aromatic flowers have become an iconic symbol of the South . In fact, these flowers are the state flower of Mississippi and Louisiana and the national flower of North Korea! Because of its value as a landscape tree it has been hybridized into scores of varieties. 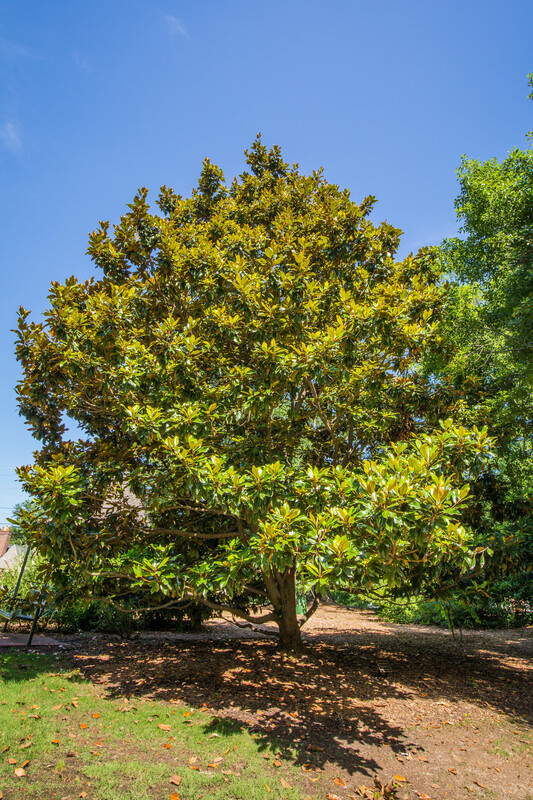 The Southern Magnolia is truly a beloved tree of the South. There are four lovely magnolia trees in Thrasher Park and the large magnolia directly behind you has played a special role in Norcross history. For many years, it was the lighted Christmas tree that kicked off each holiday season. Many of Norcross’ children have, over the years, enjoyed climbing its generous branches. After World War II, Norcross memorialized her five fallen soldiers by placing plaques beneath this graceful tree. Over time, the plaques became too weathered and, as part of the renovation of Thrasher Park a few years ago, the plaques were replaced by bronze markers, which were permanently placed in the retaining wall in front of the amphitheater. The Water Oak is a bottom land species of oak found all across the southeastern U.S. It is a native tree that has shown tremendous potential in its adaptability to thrive in a variety of soil types, and it is most frequently used to restore bottomland forests. It grows 60 to 70 feet tall and to a diameter of 2 to 3 feet. 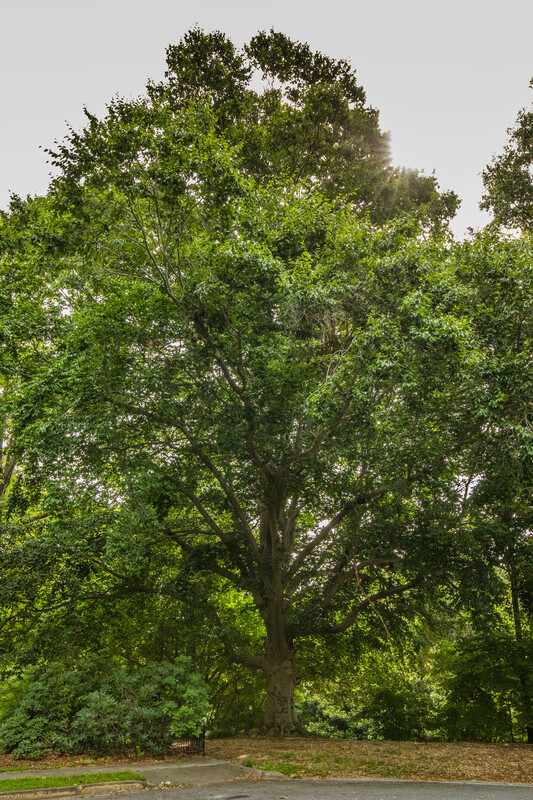 The water oak has been used for timber and fuel by people in the southern states since the 17th century. The wood is commercially sold as red oak. The biggest fans of the water oak, however, are the wide range of wildlife who enjoy the abundant fall crop of acorns. These acorns are an important food for white-tailed deer, eastern gray squirrels, raccoons, wild turkeys, mallards, wood ducks and bobwhite quail. The water oak has a lot of other names too: spotted oak, duck oak, punk oak, orange oak and possum oak. This tree is found all over Norcross but unfortunately it is short lived compared to other species of oaks, with only about a 60 to 80 year life expectancy. The green ash is native to the entire eastern half of North America. It can adapt to a wide range of soil and climate conditions, and it has fast growth and provides ample shade. It also has a tolerance for pollution and road salt thus making it a popular choice as a street-side tree. 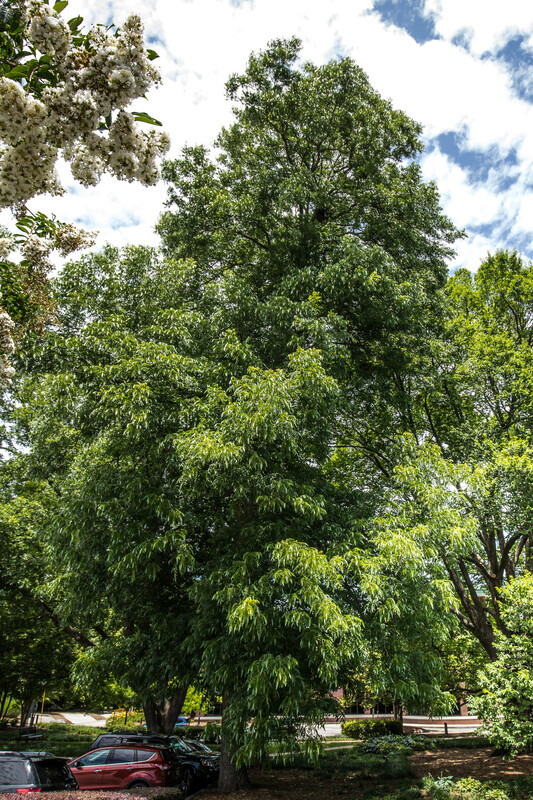 The white and green ash trees have superior survival traits and they are used as living national monuments. 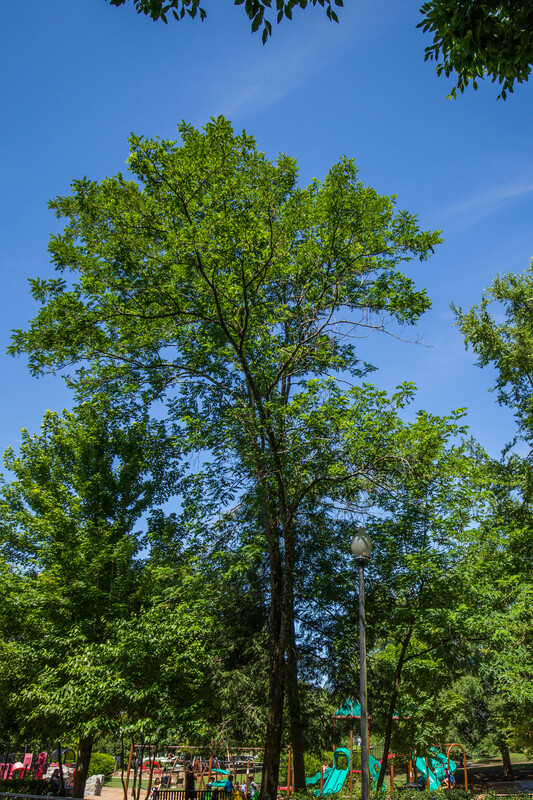 The National Park Service is protecting Thomas Jefferson’s 200+ year-old green ash and George Washington’s 250-year-old white ash which have a 600-year potential lifespan! Green ash wood, because of its strength, hardness, high shock resistance and excellent bending qualities is used in specialty items such as tool handles and most famously for baseball bats. The Native Americans used it for bows and arrows. Unfortunately, the green ash is being threatened by the emerald ash borer, a beetle introduced accidentally from Asia and to which it has no natural resistance. This is doubly unfortunate because the green ash has been used heavily as a replacement for the American elms destroyed by Dutch elm disease. The Crape Myrtle is a native of Southeast Asia and was first introduced circa 1790 to the U.S via Charleston, S.C. by French botanist Andre Michaux. 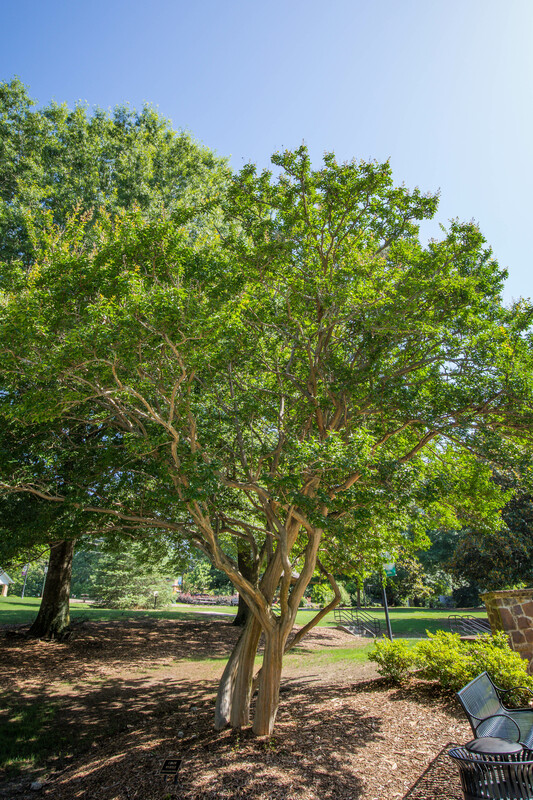 It is chiefly recognized for its profuse and colorful flowers – in fact the Crape Myrtle is often referred to as the “lilac of the South.” Because of its great landscape value, it has been hybridized into hundreds of varieties covering a wide range of colors. This most common colorful cityscape plant seen throughout the U.S. is considered one of the most versatile and prolific ornamental landscape plants, so much so that it has taken on the status of a native plant. The Willow Oak is a member of the mighty oak family and is often referred to as a “handsome” tree. It has a stand-out feature of willow-like leaves. The spear -shaped leaves appear in the spring with a light/bright green color, then become dark green in the summer, and turn shades of yellow bronze-orange, yellow-brown and russet-red in the autumn. Native to North America, the Willow Oak is a favorite selection for street trees because of its ability to survive in an urban environment. It is frequently planted along streets and in parks and golf courses because of its size, striking appearance, and relatively fast growth. The tree’s leaves have the ability to remove toxins from the air, which also makes it highly desirable in cities. 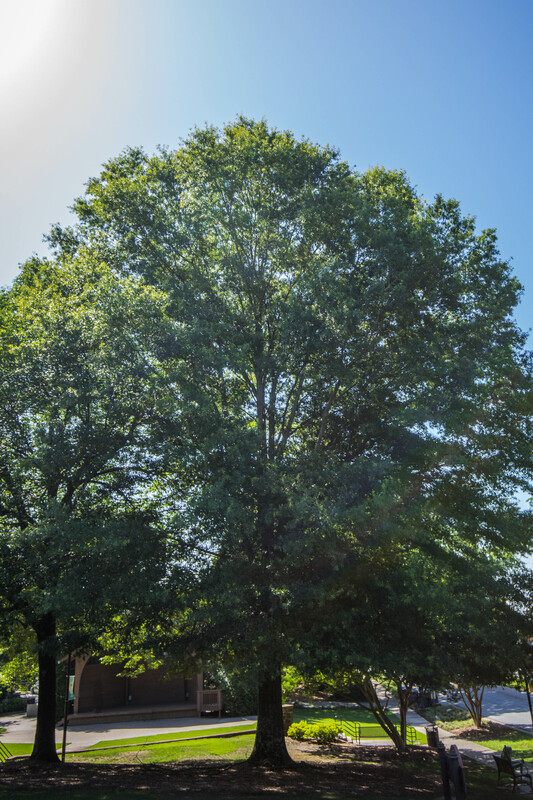 Washington D.C. rebates $100 for every Willow Oak planted by a homeowner. It is a totally pest-free tree that can grow to 100 feet tall. It takes 15 years to start dropping a prolific production of acorns, which are a major food source for wildlife in the forests. In the pioneer days, lumber from the Willow Oaks was used to make pulpits, pews, wagon axles and flour barrels. This concludes our tree walk! We hope you found it informative and enjoyable!